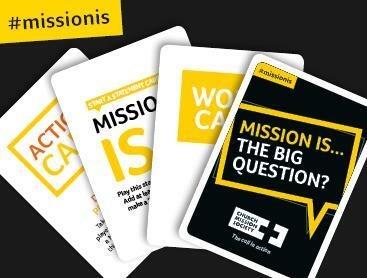 The UK’s first ever mission themed card game, designed to provide a fun way for people to examine their personal view of what mission is. NB We can only send to UK addresses. ‘Mission Is…The Big Question?’ has been designed for small groups of all ages. Each playing pack includes a selection of ‘Mission Is’, ‘Word’ and ‘Action’ playing cards and players are challenged to construct a defining answer to the question ‘What is mission?’ using the prompts provided on each card. Players build their personal statements using locations such as ‘foodbank’, ‘local estate’, ‘school’, or ‘home’; different groups of people such as ‘homeless people’, ‘my mates’ ‘work colleagues’ or ‘prisoners’ and varying actions such as ‘visiting’, ‘helping’ or ‘baking’, as well as more traditional interpretations of mission such as ‘preaching’, ‘going’ and ‘church’. Finally, the group of players are asked to vote on the most exciting ‘Mission Is’ statement from the different hands displayed throughout the game. Please note that the game is designed for, and orders can only be accepted, for the UK only.